The Swiss Mountaineer brand of wrist watch is a dependable yet still luxurious watch for those who are not willing to sit idly by the sidelines while life passes them by. Made with the craftsmanship and dependability you expect from Swiss watches, expect your watch to make it through any adventure when it is a Swiss Mountaineer. 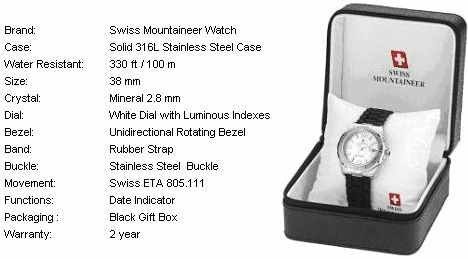 The Swiss Mountaineer 1124 is a solid wrist watch constructed from stainless steel and mounted on a easy to wear rubber strap. With a two-year warranty to back it up this is one watch that will stand up to anything your life can throw its way.